April 1-7 is Golden Rule Week, inspired by a 2005 awareness exhibit entitled A Blessing to One Another: Pope John Paul II and the Jewish People. This award winning exhibit still tours the country spreading a message of peace and reciprocity. The images feature Pope John Paul II visiting people around the world, and the message of the Golden Rule from different religious texts. Christianity • Luke 6:31 Do unto others as you would have them do unto you. Judaism • Talmud Shabbat 31a What is hateful to you, do not do to your fellow man. Islam • An-Nawawi’s Forty Hadith, 13 No one of you is a believer until he desires for his brother that which he desires for himself. 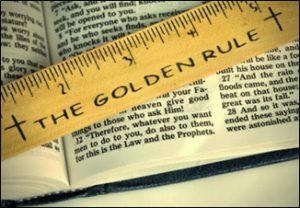 Surprisingly, most religions share the Golden Rule as a core belief which unfortunately has been relegated to mere words and no action. It is rare to find acceptance, equality and forgiveness between members of different religions. Empathy: We want others to treat us kindly and be aware of the challenges we may be facing so, when practicing the Golden Rule, we’re more empathetic towards others as well. Understanding: We want to be heard and for others to understand our point of view and the obstacles we’ve overcome. When we practice the Golden Rule, we strive to understand others. Acceptance: Nobody likes to be judged, so why are we so quick to judge others? The Golden Rule prevents us from doing that. So let’s try and use Golden Rule week to remind ourselves of the importance of treating others the way we would like to be treated. Are you in?